Precison landings, also referred to as accuracy landings or spot landings, are meant to improve the pilot's judgement and control. There are a variety of ways for executing precision landings, but on this flight we'll work on those made from a power-off 180° turn. It may take some practice to get this perfect, but you'll learn a lot about controlling the airplane in the process, and it really feels good when you nail it. Overview. For this procedure, first set up normally on the downwind leg, but fly a tighter pattern, remaining closer to the runway on the downwind leg than you have before now. As you come to the end of the runway, start a standard rate turn to the left. When the turn is established, reduce the throttle all the way and establish a glide at 65 knots while continuing the turn. (On the 68000, glide at about 60 knots with gear down). When you roll out on the runway heading, the threshold should be immediately ahead. The Pattern. Take off normally and level off at cruise power and at traffic pattern altitude, in this case, 900 feet. Maintain your departure heading of 240° a little longer than usual, however, to fly down beyond the airport a bit before you start your turn to come back around onto the downwind leg; this will give you a bit more time for setting up. Then make a 180° standard rate left turn to heading 060°, onto the downwind leg. Keep the turn tight. Initial Set-Up. On the downwind leg, reduce power and lower 10° flaps in the usual way, so you end up at 95 knots. (On the 68000, gear down to about 70 knots). Tightening the Pattern. 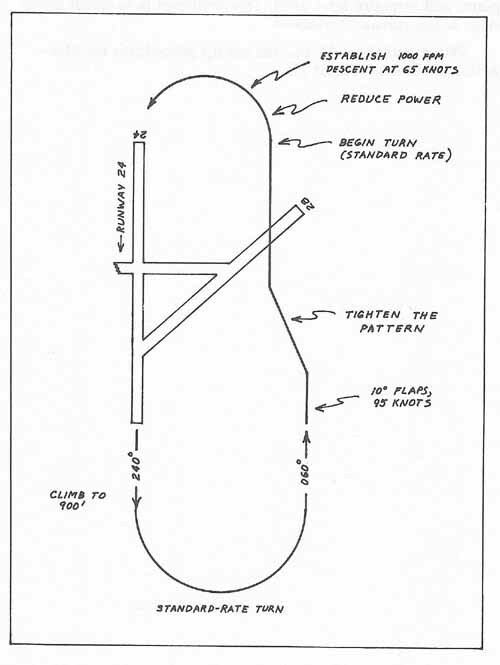 You want to fly a downwind leg that's a bit closer-in than usual, so jog left a bit now so you'll cross over Runway 28 (the diagonal runway) at a point inside its threshold, as shown in Figure 3–1. 180° Turn onto Final. As soon as you come to the end of the runway, as determined by reference to the overhead radar view or the left side window view, start a standard rate turn to the left. Establishing the Glide. When you've established the standard rate left turn, throttle back all the way. As the nose begins to fall, gradually begin to nudge back on the stick, keeping the nose up as airspeed falls off to around 65 knots. Maintain your standard rate turn throughout the process; remember that the bank required for a standard rate turn will be shallower now (at 65 knots) than it was before (at 95). You should end up in a turning glide at about 65 knots, with a rate of descent of about 1000fpm. Nudge the stick up or down, if necessary, to maintain your airspeed. If you allow the nose to rise too much, your airspeed will fall off, and you'll get a stall warning. Use engine power to extend your glide if you have to, but try to execute the procedure so that you don't need it: Ideally, the landing will be completed from a continuous, smooth, gliding turn that ends right at the runway threshold. Use the stick (up or down slightly) to control airspeed. Adjust RPM to control glide/rate of descent. Landing. Roll out on the runway heading of 240°. Keep an eye on the altimeter—you'll touch down at an altitude of 99 feet. In this configuration, at 65 knots with 10° flaps, the airplane will virtually land itself. The challenge is to touch down right at the runway threshold. When you're ready, use the set-up procedures for Mac-Arthur Field from Flight 11.